Saturday morning coffee with the sun shining and a light breeeze swirling. The doorbell rings. Has Christmas come early? To my surprise it has, as the postman hands over the latest International/DAE collaboration, Dayton Reloaded (released on the Boxcar label). 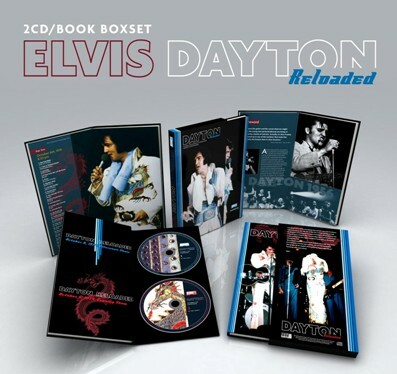 Comprising both the afternoon and evening performances of Elvis' appearance at the University of Dayton Arena in Dayton, Ohio on October 6, 1974, and an accompanying hardcover book.......this set lives up to its pr of offering beautiful art layout and being a fascinating audio visual release. Quite simply this is a stunning release marking the 35th anniversary of the shows! Housed in the customary hardcover longbox, you are initially struck by its sturdy construction and quality visuals in glorious full color. While Elvis had performed some memortable shows earlier in 1974, the September-October 1974 tour was not one of his best, with highlights sparsely dotted across the shows. The infamous College Park performance was during this tour, but by October 6 it was clear Elvis was up and enjoying himself. What marks Dayton Reloaded as being particularly memorable is its potent audio-visual and narrative record of an artist, while struggling with his life and career, still being able to connect with and lift in response to his (especially receptive) audience of 13,500 screaming fans. Elvis was always very popular in Ohio! The 100 page book features many "in your face" photos which are literally mouth watering. Elvis is resplendent in his Blue Rainbow, Chinese Dragon and Peacock Suits and the strong, vibrant colors are striking. It seemed quite like a miracle but he looked prim and proper for the evening show, dressed in the Peacock Suit......The man up there on that stage at the Expo Center in front of 14,000 screaming fans was bored to death. He was trapped in his own hopelessness. A Mad Tiger that had been caged for way too long. The text is strong, giving the reader a real sense of the ups and downs Elvis experienced during the tour. Hunters Art are credited with the set design for Dayton Reloaded and they deserve high praise for the quality result. The durable box, hardcover book and great page design are all first rate. The two CDs feature fantastic artwork on the discs and the audio has been remastered by the legendary DAE guys from the original soundboard tapes, meaning excellent sound reproduction and clarity. Both shows run for just under an hour. While essentially a standard set for Elvis at the time, Elvis' good spirits and the tight playing of the band combine beautifully to deliver two strong shows. The stronger of the two is Elvis' evening performance which is the subject of the following review. By 1974 Elvis was increasingly dropping most of his bombastic big ballads (such as You've Lost That Loving Feeling and Suspicious Minds) in favor of equally powerful gospel tracks and a more heavily country flavoured song list. For the evening show (disc 2) the opening track, See See Rider, with the King in full control sets the scene for is to come. Elvis plays with his audience throughout his performance and his vocals are strong. On I Got A Woman/Amen medley, just when we think the song has finished it becomes obvious Elvis is far from finished and JD Sumner still wants to explore the incredible depths of his bass voice. A six and a half minute delight. By the early 70s it was obvious Elvis had generally tired of his catalog hits and rarely gave them more than a rushed and cursory treatment. Love Me was one of these and is most notable for Elvis slightly changing the opening lyrics (his evening performance of the song is far superior to that in the matinee show). He is more in the moment with the first of two Olivia Newton John covers, If You Love Me, Let Me Know. Fever follows....a perennial crowd favorite, and Elvis incites his women fans at every move even when he forgets or mucks around with the implicitly searing lyrics. On Big Boss Man Elvis' voice noticeably rises in volume and segues into toe tapping delivery with the Sweet Inspirations in fine voice behind. A standout, big beat performance! Love Me Tender is sincere and surprisingly not rushed but Hound Dog gets cursory treatment and you sense Elvis can't wait for his short one and a half minute version to end. Another crowd favorite, The Wonder of You (replacing It's Midnight from the matinee show), is solid without being outstanding. After a routine Blue Suede Shoes, the customary introductions (with some amusing belt tightening by Charlie and funky guitar work and pounding drums by James Burton and Ronnie Tutt respectively) are interspliced with an atmospheric Lawdy, Miss Clawdy, before Elvis gets All Shook Up, Teddy Bear/Don't Be Cruel and Heartbreak Hotel out of the way. All are short and performed quickly but still resonate. A humorous Why Me, Lord follows with Elvis joking with JD. Elvis proves he can still play the guitar and we are also treated to one of his best versions of That's All Right, Mama in some time. Blue Christmas may have seemed somewhat early in October but Elvis' cover of the Olivia Newton John hit, Let Me Be There, was a welcome inclusion at any time of the year. Elvis asks his audience if they saw Blue Hawaii before singing what he tells them was the most requested song from the movie: Hawaiian Wedding Song (featured during both shows). It is a sincere version which captures shrieks from the women in the crowd. Elvis decides the ending was not romnantic enough and re-sings the closing verse in a rather light hearted tone. Johnny B. Goode is a strong, rock 'n' roll version before Elvis thanks his audience and closes the show with a better than average Can't Help Falling In Love. Overall, the evening show in Dayton was a musically strong and rewarding experience with its highs far outweighing its few lows. 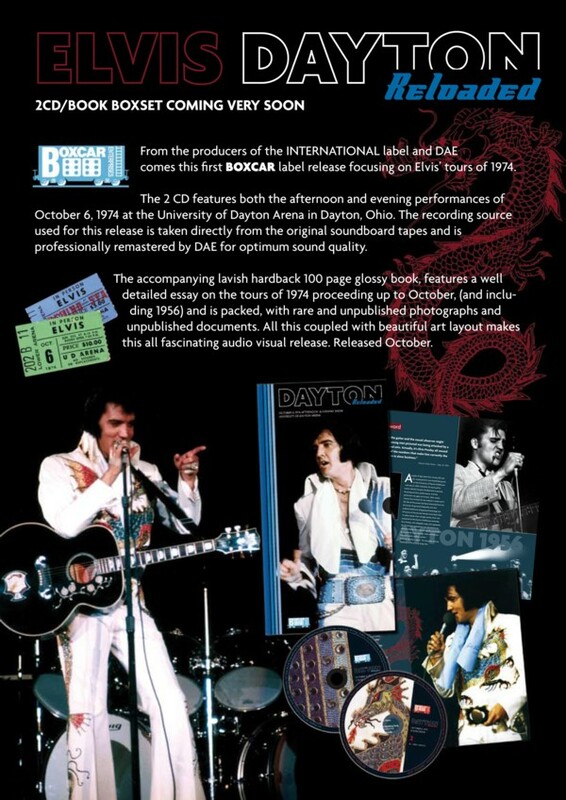 Elvis in Dayton circa 1974 was previously issued on releases including Fort Baxter's A Profile The King on Stage Vol. 2 and Madison's Breathing Out Fire. However, the Boxcar issue is the best audio release to date. Verdict: Dayton Reloaded is wonderful release with both the book and CD elements complementing each other to produce a synergistic and highly satisfying result. Those of you lucky enough to acquire a copy from its limited edition of 1,000, will justifiably, be smiling from ear to ear. Enjoy!! EIN Note: The Boxcar label has exhausted all 1,000 limited edition copies of Dayton Reloaded. Check your local stockist for copies. EIN DVD Review: "Elvis Love Me Tender The Love Songs"
Book Review: The "first" Dr. Nick book or "When Elvis Meets the Dali Lama"